Heralding a new year of music Clubbers Guide to 2013 loads up the biggest and best club remixes onto two discs of massive tunes which will define the club sound of 2013. Renowned for unearthing the future hits of Australian clubland, Clubbers Guide to 2013 delivers a perfect blend of big name bangers and you-heard-it-here-first remixes, mixed to perfection by the new wave of Australian DJ/Producer talent. From the front room to the back, Clubbers Guide to 2013 has got your new year of music covered! Ministry of Sound Clubbers Guide hits Darwin with the Australian based duo, Denzal Park. Denzal Park are somewhat of an enigma, sharing an equal amount of success in both clubs and charts, it’s with little or no surprise that their records earn support from EDM’s best of the best. Kicking off their partnership 4 years ago with the Beatport no. 1 ‘Finally 2008′, Denzal Park have set their standard remixing for names such as Dirty South, Avicii, Martin Solveig, Full Intention and Pnau. Their original floor-stompers ‘Amarok’, ‘Nammos’, ‘Militia’, ‘Filterfreak’, ‘Ascension’ and ‘I’m a Drum Machine’ have torn their way through charts across the world, gaining them support from The Swedish House Mafia, Pete Tong, Fedde Le Grand, David Guetta and Laidback Luke. The duo have also written and produced two platinum-selling singles and received Australia’s highest musical accolade last year, picking up an APRA award for Dance Work Of The Year. Combining their production powers through a mutual affinity for electronic music, Kam Denny and Paul Zala have carved their initials deep into the dances floors and DJ-booths of their homeland’s biggest nightclubs, darkest dance-halls and festival fields, delivering their trademark concoction of euphoric melodies and down-to-business rhythms to thousands of eagerly pointed ears. 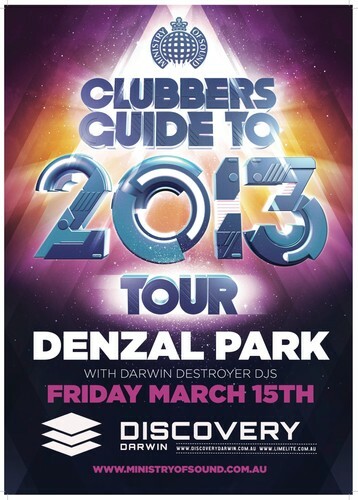 Ministry of Sound Clubbers Guide 2013 with Denzal Park at Discovery Darwin Friday March 2013, doors open at 9pm.